Beautiful! I wish I was a morning person, lol. I catch more sunsets than sunrises, unfortunately. This is such a lovely photo. I enjoy all of your photos and your stories, but this one seems like the perfect counterpoint to the national sadness of this week. Thx. nice to see the sun when it's so dark and rainy here. We can ask questions???!!!! I didn't know this. gorgeous! What kind of camera do you use? That's a magnificent picture; really mind-blowing! Beautiful photo. 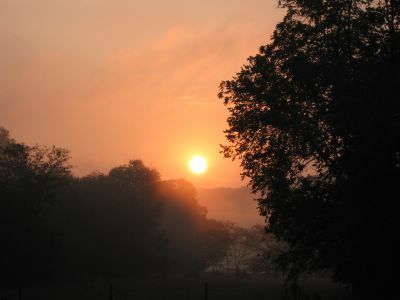 Our sun rises "late" because of the tall redwood trees. By the time we see it all the peachy glow is gone. We have great sunsets though!